A small oval candy that has a hard outer covering enclosing a gelatin-like mixture that is sweet and chewy. 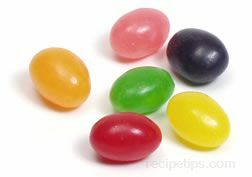 Jellybeans are produced in many flavors including vanilla, cherry, lemon, lime, orange, licorice, spice, and many others. They are usually artificially flavored and colored.